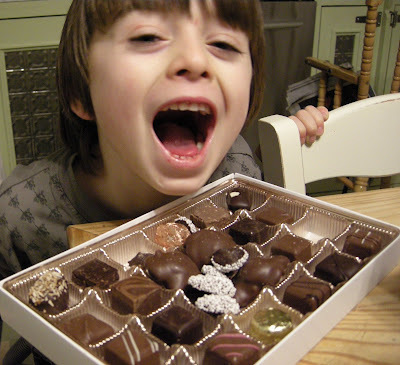 Izzy Eats: The art of raising a gourmand, one bite at a time: A Box Of Chocolates Of His Own: Random Assortment or Custom- Selected? A Box Of Chocolates Of His Own: Random Assortment or Custom- Selected? Izzy didn't just want a box of hand-selected chocolates, which is what I usually bring home. Oh no, he instructed me to purchase the gift-box assortment. At first I was befuddled by his choice, imagining that like myself, he would want to know exactly what he was getting. As I waited my turn at the chocolate shop, I realized that his request made sense. When shopping at Birnn Chooclates it has been my habit to select my chocolates from the display case. That way my box will contain only my preferred flavors, which usually means marble toffee, butter crunch, raspberry jellies, coconut kays and peppermint patties. As Izzy developed his own taste, I allowed him to do the same. When he requested the gift-box assortment, I was suddenly reminded of my childhood chocolate consumption. My family would receive chocolate gift boxes periodically and I looked forward to trying to sampling the mysteries inside. Would it be creamy raspberry (my favorite) or chewy caramel? Oozy Cherry or something with nuts? I longed to just take one bite of each, putting back by least favorites and savoring the others. And so I watch, each night as Izzy takes out his box for his one chocolate. He carefully ponders his selection, allowing me to eat the ones he doesn't like (only the turtles). I may just have to join him and get my own gift box one of these days.